This 3 Days mountain Elgon hiking safari will take you to Elgon mountain national park which is found in eastern Uganda in the district of Mbale. You will visit the sipi falls, river Nile and mabira forest. Take breakfast very early in the morning and then transfer to sipi falls will kick off by our company driver/guide. You will have first stopover at mabira forest where you will hike mabira, viewing tall species of trees, monkeys and enjoying nature walks. You will spot the sugar cane plantation, tea plantation and local people selling goods on the road side. Lunch stopover will be at jinja in source of the Nile café for the best meals. After lunch proceed to sipi falls and overnight and dinner will be around sipi falls. Have morning breakfast from the lodge, after go for hiking in the bottom of sipi falls. 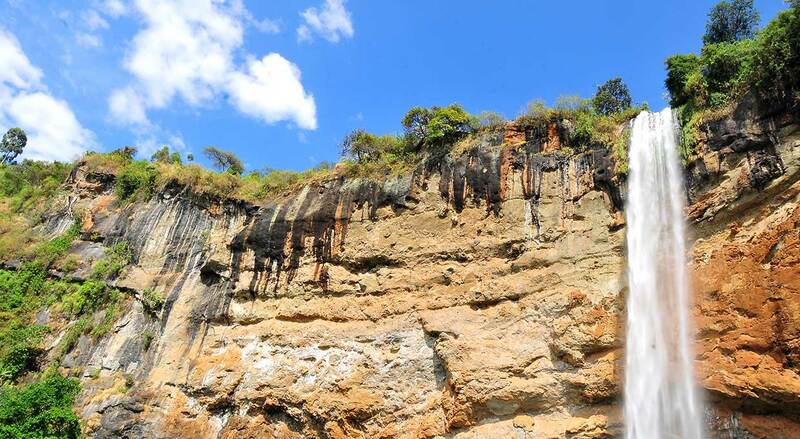 You will start from Mountain Elgon forest exploration centre where the tour starts; you will visit the sipi falls and see how water hits the rocks; you will view water flowing from the top of the falls to the bottom and visit the cave in sipi falls. Return to the lodge for lunch and after you will have nature walks to the local community of sabiny people where you will learn more about their traditional life and way of life. End of day 2 back to lodge for dinner and overnight. Take African coffee and proceed to jinja for another tour at the famous Bujagali falls and do water rafting in the white waters of river Nile. You will visit the source of river Nile and have chance of sighting the longest River in Africa. Lunch will be taken from jinja town at source of the Nile café and continue to Kampala to the hotel or to Entebbe international airport. What is included in the safari? 2 Day Uganda birding safaris. Eco bank plaza room 1-T. Thanks Robyn for sharing this photos of chimp with us. Trek chimpanzee from Kibale forest national park a home of primate. When you talk about Uganda being the Pearl of Africa, the true definition is right here in Lake Bunyonyi the second deepest lake in Africa.Book for your honey package to Lake Bunyonyi through Jewel safaris. For more information email us on info@jewelsafaris.com or jewelsafarisafrica@gmail.com. Visit Uganda the Pearl of Africa.